Havanas flip flops 41-42. Dispatched with Royal Mail 1st Class. Havana Mens Flip Flops Size 10. Condition is Used. Dispatched with Royal Mail 2nd Class. Havana flip flops, pink size 20. Worn a few times so in good condition. Has stretch back ankle strap for support and to keep on. Dispatched with Royal Mail 1st Class. 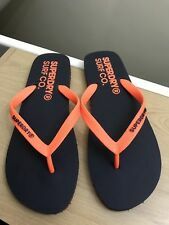 Superdry men’s sleek flip flops. 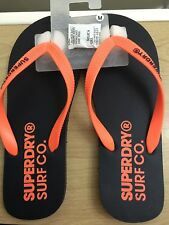 A pair of classic flip flops with a Superdry Beach Co. logo print on the upper sole and a branded strap. The flip flops are finished with a branded lower sole. This is a genuine Superdry item for sale. Brand New with Tags. Dispatch within one working day. Thank you for looking. Returns Policy: Please note I do not accept returns. havana flip flops 22/24. Condition is Used.Dispatched with Royal Mail 2nd Class. Dress & Formal. Fashion Sneakers. Toe Style: Open Toe. Occasion: Casual. Heel Height: 0.25. These shoes typically show a little more wear in their soles and may have blemishes such as scuffs and/ or wrinkles.